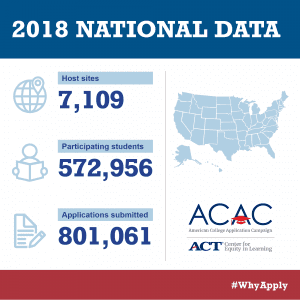 During the 2018 American College Application Campaign, a record-breaking 7,109 high schools reported hosting college application completion events. And we’re thrilled to share those host sites assisted 572,956 seniors in completing 801,061 college applications! Now, acceptance letters are rolling in and students are weighing their college decisions. Many schools across the country will soon host College Signing Day events (in conjunction with the national College Signing Day activities) to lift up and celebrate the choices made by the Senior Class of 2019. As we prepare for these celebrations, let’s take a moment to reflect on how we got here. School counselors have been hard at work since September to ensure that the class of 2019 is ready to step onto a college campus this fall. For many, this means hosting events to support students in completing their college applications. ACAC host sites organize application completion events throughout the fall, most in October and November, during the school day to ensure every senior has the opportunity to apply to college. Navigating the college-going process is complex and students, especially underserved learners, can find the admissions process confusing. ACAC events ensure every senior knows they are college material and help break down the steps of the admissions process. It sounds simple, but you can’t go to college if you don’t apply. We want to send a resounding “Thank you!” to counselors, college advisers, teachers, principals, volunteers, and everyone who played a role in helping the class of 2019 apply to college. Because of your efforts, we have opened the college door for 572,956 seniors. We can’t wait to celebrate their college decisions and watch them take this next big step on their college journey.